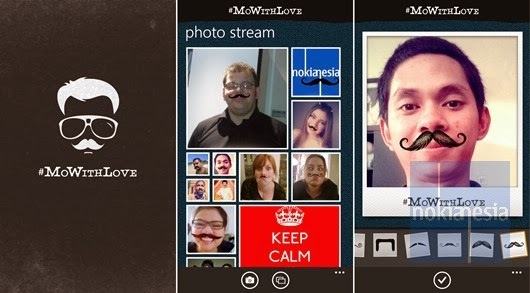 Nokia release an application to support global Movember Charity Movement. For your information, Movember is an annual, month-long event involving the growing of moustaches during the month of November to raise awareness of prostate cancer and other male cancer and associated charities. 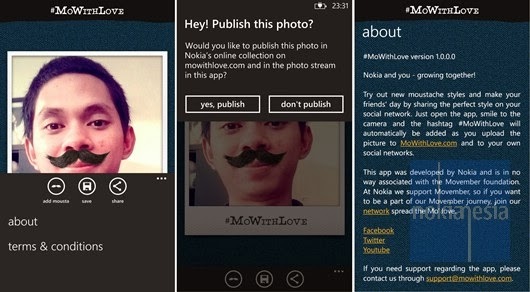 With this #MoWithLove appication for Nokia Lumia with Windows Phone 7.x and 8, You can add your own moustache to your photo or simply take a photo of you and add with moustache. After you choose your own moustache, you can share to #MoWithLove dedicated web on mowithlove.com and also share to your Fcaebook or Twitter account. So, Join the #MoWithLove and show your moustache on Twitter and Facebook profile picture.